I have some very exciting news to share with you today, as my new business has gone live last week! It’s the reason why it has been quiet over here at Paprika Patterns, as it took us over a year to get it all set up. And with us I mean Erin and I, as I also have an awesome business partner! You probably know Erin fro Tuesday Stitches, formerly SeamstressErin. 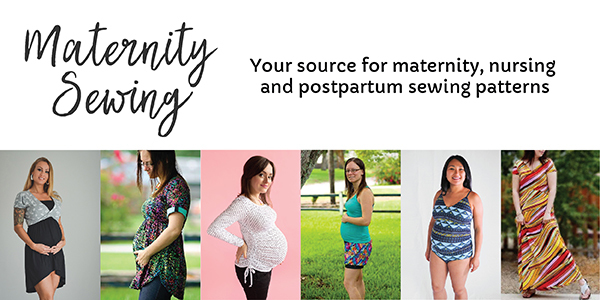 So let me introduce you to Maternity Sewing: your source for Maternity, Nursing and Postpartum sewing patterns! It’s a marketplace where we have gathered all the maternity and nursing patterns from indie designers we could find. We have over 70 patterns right now, and many more in the process of onboarding. We hope to create a community for pregnant and nursing sewists, where we’ll share maternity style inspiration, tips and hacks, designer interviews, and promote body confidence. The latter is also why we included ‘postpartum’ in our mission. It can take a long time for your body to return to ‘normal’, and even if you manage to get back to your old weight, the shape of your body will probably have changed. A lot of women struggle to get reacquainted with their changed body, and that’s why we want to include postpartum too. The idea for Maternity Sewing came when Erin and I were both pregnant at about the same time. When we had our daughters we connected further as new moms and indie designers. We noted how difficult it had been to find maternity patterns, and we set out to solve this! At first we thought of designing a Maternity Collection together, but then we wanted to make it bigger. We want to become the go-to place for pregnant and nursing sewists. It took us well over a year to get it all set up, mainly because we both work from home, have a small child, and work part time. Plus I had our 6-month renovation last year as well. Now that our daughters are toddlers (Evie turned 2 in May, Frida is turning 2 in August), we finally launched and we’re excited to have Maternity Sewing out in the world. The response so far has been hugely positive, by sewists, designers and media as well. Our shop is built to make your search as easy as possible. You can search for different cup sizes, by trimester, nursing, fabric type, a waistband under or over the belly, you name it. We’re most active on Instagram and through our newsletter, which also gives you exclusive deals and a free pattern. One other thing worth mentioning, is that we donate 5% of our net proceeds to Every Mother Counts. With Maternity Sewing we wanted to contribute to the sewing community, but also promote maternal health on a larger scale. Every Mother Counts invests in community-led programs to improve maternal health and safe childbirth worldwide. It’s been really great to have a business partner for a big project like this. We just have twice as many good ideas, it’s a relief not to have to do everything on your own, and we dare to think bigger when we carry the risks together. For me, I’m designing some maternity patterns to sell on Maternity Sewing, and in a few months will probably design some nursing patterns too. Erin already has some Maternity Sewing Exclusive patterns in the shop, and I hope to add to that soon. It’s nice to have a new challenge to design for, and there are definitely not enough patterns in this area yet!. So if you are pregnant, or have a friend who is, check out Maternity Sewing! No one commented yet. Be the first!